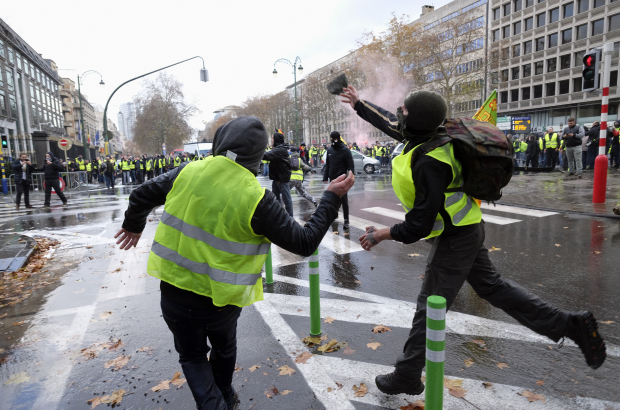 About 500 gilets jaunes, or yellow vests, protestors gathered in Brussels on Friday, moving their activities from Wallonia north into the capital. They blocked the inner ring road and destroyed property, leading to violent clashes with police. Two police vehicles were set on fire and traffic brought to a standstill by the protest, which started in France earlier this month and quickly crossed the border into Wallonia. The leaderless, grassroots movement is officially protesting high petrol taxes, but there is also a complaint that it is getting harder and harder for families to make ends meet in general. As protestors pelted police with stones, bricks and other objects, police eventually used tear gas and water cannons to disperse the group and arrested 60 people. Clashes took place in various locations, including near the Congrès train station, the EU quarter and the Lambermont at Brussels Park, official home of the prime minister. “They used everything they could find, throwing billiard balls and stones at police,” said police spokesperson Ilse Van de Keere. The goal, according to Van de Keere, was to break through the cordoned off zone in the centre of Brussels. “But they did not succeed,” she said. By the time the evening commute started, things had quieted down considerably, but the streets were a mess, bringing traffic to a standstill. Charles Michel’s spokesperson told Bruzz that the prime minister was willing to hold talks with the yellow vests but that no request for a discussion had been received. The group also did not submit a request for a protest permit, which means that the action was illegal.